And a lucky, lucky knitter! This is the Sock Hop yarn that was my prize in Teyani’s blog contest. It’s called “Blue Suede Shoes.” Not only do I get to make a pair of socks with this coveted yarn, but I can now see how the roving I’m spinning compares. I think I’m doing okay, on both counts. K has just finished a beautiful sweater out of this alpaca yarn. He made Elsebeth Lavold’s Aud from the Viking Knits Collection. It’s stunning. That’s all I can say. He’s got a pretty serious cashmere addiction going on, too. You know, it’s a wonderful thing to see a knitter’s eyes light up as they talk about yarn and what they want to knit with it. I made a little progress on a couple of things, but not enough to show you. I’m about to finish the sock I was knitting on my trip, and I worked a bit on this ongoing, neverending scarf, but that’s it. I got to have a little visit with my friend V, and we talked Life and Parents and Fiber and such. She’s making some delightful handspun crocheted hats, sweet sturdy round shapes that she makes up as she goes along. Re-entry has been strange — where am I, and what day is it? I’m happy to be home and back to my regular life, even though it involves making my own coffee and my own bed. My mother continues to improve in the little ways that mean she will be allowed to go home soon. Although we know that this setback was just one more in the long, inevitable string of setbacks, we’re trying to be relatively positive about it. What else is there to do, after all? Today is one of those brilliant, blinding days that says it’s Spring, but reminds me that our Spring is always very slow to unfold. The trees haven’t begun to swell, the bulbs are nowhere to be seen, and though the sun is warm the temperature isn’t. I’ll still enjoy it, though. It’s my day off! Sweet Jane,As per your usual yarns & as per my usual comments, I’ll say “bee-ute-full” color!Glad to hear that you are safely home to Miz A & your own home. Glad that you are able to find some of the light that’s currently there in your Momma’s life.XOXO to you. so glad that it was you – AND that you like the color.Welcome back home – glad that your Mum is healing. that’s the best news of all. Every little bit of progress is worth celebrating!Have a blessed week dear Jane. I keep forgetting to call you! I love my socks 🙂 They were waiting for me in my room when I got home for break, which was a fabulous surprise. Thank you thank you thank you! Glad you’re home safe and sound! And I’m so glad to hear that your mother is feeling better. 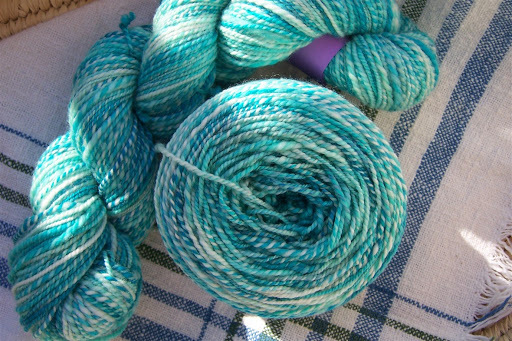 What a relief.Beautiful yarn, so aqua blue. Congratulations on winning the lovely yarn. I happened to find your blog when searching on Google.You have made some beautiful things that inspire me(I even bought some yarn that you have) Wonderful pictures of LI that make me want to come to the US oneday (I live in the Netherlands). Glad to hear that your mother is feeling a bit better.